2018 Christmas Photos, News, and Videos | Just Jared Jr.
Camila Mendes and Charles Melton are a really new couple, but are already achieving those couple goals. The 24-year-old Riverdale actress shared her gift from Charles that she received for the Christmas holiday. “he done good,” Camila captioned on her Instagram Stories, showing off a pink box and tissue paper from Miu Miu. Later on, Camila also shared that they both were headed to South Korea for a little trip before they had to go back to shooting their series in Vancouver. Check out both pics in the gallery below! Who else had an amazing Christmas holiday? We know a lot of influencers who did! 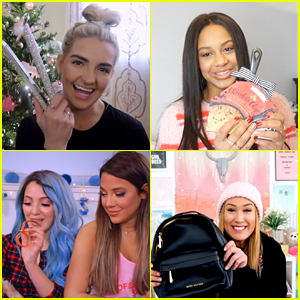 Niki and Gabi DeMartino, LaurDIY, Nia Sioux, Alisha Marie and Rydel Lynch all showed off the gifts they received for the holiday in some fun videos they uploaded this week. From beauty products to chic new bags, the ladies got some really cute gifts from their family and friends. Check out all the videos below and let us know what your fave gift that you received was! It’s a very special day for Stephen Amell, not just because it’s Christmas, but because it’s also his sixth wedding anniversary! 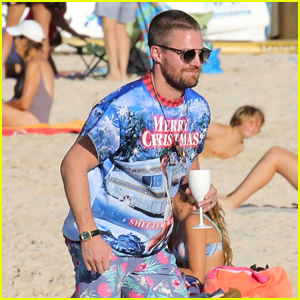 The 37-year-old Arrow actor returned to the the site of his wedding to celebrate the occasion on Tuesday (December 25) in St. Barts. Stephen was joined by his wife Cassandra Jean and their five-year-old daughter Mavi (not pictured), as well as a bunch of their friends. “6 Years. Same Beach. One Kid. Bigger Feelings. Happy Anniversary Cass,” Stephen captioned the below photo on Instagram. Some of the friends that were spotted on the trip included Aisha Tyler, Roswell, New Mexico writer Carina Adly MacKenzie, filmmaker Emmett Hughes, Netflix social media manager Jarett Wieselman, and more. Stephen was seen chatting with celeb stylist Warren Alfie Baker on the beach. He’s in town with longtime partner James McCourt. After the day at the beach, Stephen was seen hopping into the trunk of a car! 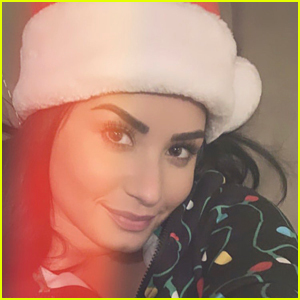 We’re so glad to see Demi Lovato looking happy and healthy on Christmas this year after the struggles she went through earlier in the year! The 26-year-old singer took fans inside her holiday on Tuesday morning (December 25). She enjoyed her day with mom Diana, step-dad Eddie, and sisters Dallas Lovato and Madison De La Garza. “Merry Christmas guys!!! I love you all! !” Demi captioned a photo of her Christmas tree with all the presents underneath. Demi joked that the day was “really all about the dogs over here” and showed footage of the cute pups getting their gifts. Demi also paid tribute to her late dog Buddy, whose picture was on an ornament. Kylie Jenner & Baby Stormi Wear Matching Outfits on Christmas Eve! Kylie Jenner and her 10-month-old daughter Stormi Webster look amazing in their matching outfits while attending the Kardashian-Jenner-West Christmas Eve party on Monday night (December 24) in Calabasas, Calif. The 21-year-old reality star left the party early and she took to her socials to explain why. “This is me leaving the party early to go give my baby a bath (while wearing this dress because I couldn’t get it off by myself) and put her to sleep and it was the best xmas eve yer,” Kylie wrote on an Instagram Story photo of herself in the driveway. Sophie Turner's Family Hosts the Jonas & Chopra Families for Christmas! Sophie Turner‘s family is based in London and her fiance Joe Jonas and his family traveled there to celebrate Christmas this year! 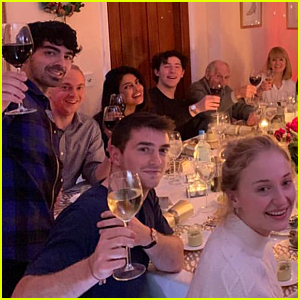 The Turners hosted the holiday on Tuesday (December 25) and others in attendance included Joe‘s brother Nick Jonas and sister-in-law Priyanka Chopra, and his brother Frankie. Joe and Nick‘s parents Kevin Sr. and Denise and Priyanka‘s mom Madhu were among the guests at the large dinner table. Sophie and Joe sat next to her older brothers Will and James. Missing were Kevin Jonas, his wife Danielle, and their two kids, who stayed in the U.S. with her family.